What could be better than going for a little run with 25,000 of your closest friends? Doing it at Disney World, the Happiest Place on Earth, that’s what. Marathon Weekend at Disney is the culmination of months of training, countless early mornings, blisters and probably a few pairs of shoes too. After registration, travel and the expo, all that’s left is the race. Here we go. Combined, Chad and I (Cindy) have completed 73 runDisney races and 30 runDisney challenges! We look forward to this weekend every year! We’ve put together a complete survival guide covering all aspects of the race. This six-part series will get you prepared and ready to run! Part 1 covers the 6 things you need to know before you leave for Marathon Weekend. The time has finally come and you are going to be running a fantastic runDisney race. Here are 10 things you need to know to have a fantastic race experience! The corrals will start in waves. The time between the waves changes every year, but generally, they are about 5-7 minutes apart for the 5k and 10k and 2-3 minutes apart for the half and the full marathons. In the past, there have been 6 corrals for the 5k and 10k and in 2017 there were 16 corrals for the half and full. However, in 2018 for the half and full marathon, there was 8 very large corrals with 3 mini-wave starts within each corral. Be sure to let your spectators know that the time you actually start will be delayed by however far back you are in the waves. Give them an estimated race start so they can properly estimate where you will be on the course. (Be sure to read part 6 in this series for spectator tips). We’ll say it again; these races are huge. In 2018, the 5k and 10k had over 12,700 runners. The half had 26,000 runners registered and the full marathon had 22,000. Many people are shocked to run in such a crowded race. Having the right expectations of how you will move through the course is one of the best ways to set up a fun and satisfying day. It will be crazy busy in some sections, so busy that you will have no choice but to walk. There will be spots that you will be stuck and cannot pass. There will be people who do silly things that annoy you (see #3 so you are not one of them). If you let these instances frustrate you then you will have a miserable race. This isn’t the course or crowd to qualify for Boston so relax and have fun. You need to expect all these little annoyances, deal with them when they happen, and then move on. Just keep running as Dory would say. Corral placement will play a large part in how busy your race experience will be. For the 5k and 10k there will be fewer people, but many more walkers, especially in the 5k. Generally, those in corrals A and B will have the widest open space. For the half and full, runners in corrals A-B will have the advantage of fewer people. Fewer is relative though, as thousands of runners are in each corral. If you are going for a personal record (PR) then you’ll want to get in your corral as early as possible so you are up in front. While possible to PR (at least for first timers 🙂 ), it’s a difficult course to do so. There is a lot you can’t control as far as the crowded course goes. Again, be mentally prepared that you may not PR because it’s too busy. You can still have a great day even if you don’t make your time goal. Proper running etiquette will go a long way to making everyone’s race experience better. runDisney events are very first-time racer friendly. Many runners are running their first race and may not know certain “rules” of running etiquette. Proper expectations go a long way here. You can’t control other people, but you can set a great example of what you should do. You don’t want to be “that” runner who annoys everyone. Run or walk no more than two abreast. There is nothing more frustrating than trying to get past a group of people who are taking up the entire path making it nearly impossible to pass. We get that you want to stick with your friends or pacing group, but please leave enough room by staying to the right and run/walking no more than two abreast. If passing, let the person know by saying, “Excuse me,” “On your left,” or “Coming through.” If someone is passing you, move to the side and let them pass. If you are running and want to start walking, raise up one of your hands and move to the right to alert the runners behind you that you will be slowing down to walk. Feel free to shout words of encouragement to other runners. When stopping for water stops, raise your hand to alert others that you are stopping. Snot happens. It’s a part of running. Since few people run with a box of Puffs Plus the second best option is the time-honored technique of the “farmers blow”. If you find you need to clear your schnoz, by all means, do so. It’s socially acceptable during a race. But for the love of everything decent and holy, check to make sure the area is clear before you unload. There is nothing worse than being baptized by a fellow runner. When the big moment comes to run through Cinderella’s castle, enjoy it. Take it all in. But keep moving. This is a very narrow area of the course and there are thousands of people behind you. DO NOT STOP before the castle, in the castle or on the ramp coming out of the castle. Besides being very inconsiderate to other runners, there is a high risk in this spot of collisions and injuries (we see it every year). If you’d like a great picture in front of the castle stay left and peel off at the bottom of the ramp. There is plenty of room in front of the castle stage for selfies and several Disney PhotoPass photographers as well. It’s great to be prepared, but go ahead and leave the 50-gallon Camelback hydration system at home for the 5k and 10k. There is more than enough water if needed for these relatively short races. Professional photographers from Disney’s PhotoPass will be positioned at multiple race locations before the event, on the course, and at the finish and post-finish areas. On the course, there are multiple spots with Characters. Please note that these are Disney photographers and are now included in Disney PhotoPass or Memory Maker packages–an even better reason to purchase that Memory Maker package. Annual Passholders will also have free access to the race pictures since Memory Maker is included in their pass benefits. After the event, you’ll need to manually add these pictures into your MyDisney Account using your Bib number. Clear instructions are included in the Event Guide and on the back of your bib. You may add up to 5 bibs per account per race. If you are running with a group only one person needs to purchase the package. Runners are welcomed and encouraged to take pictures during the race. However, remember that selfie sticks are prohibited by runners and spectators on Walt Disney World property. There are some photo spots without Disney photographers but usually, runners are happy to take turns taking pictures for each other. There will be character stops along the course, but they are never announced beforehand. You never know who you’ll see on the course! For more information about Memory Maker be sure to read our article here. PhotoPass photo taken during a very cold 2017 Disney Marathon. Disney does a fantastic job of making their courses exciting. Besides characters to pose with for pictures, you’ll find marching bands, DJ’s, puppeteers, and other fun things to push you through your race. For those running the half and full, you’ll also have the excitement of running through Magic Kingdom and through Cinderella’s castle! It’s hard to top that! Not every inch of the course has entertainment, particularly in the marathon. Certain sections of the course are just roads that can be pretty boring. Disney discourages headphone use, but they are certainly allowed and many people run with their own music or an audiobook. If you do, just make sure the volume is low enough so you can hear the people around you. Before the race, have a plan of often you will hydrate and fuel. 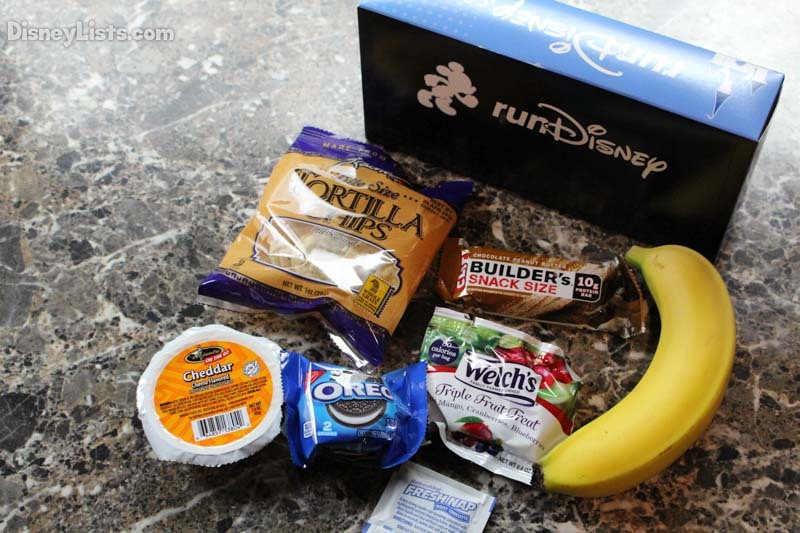 Disney offers water, Powerade, and Clif Bar products during the races as well as bananas on the full marathon. If you prefer a different race fuel, you will need to bring your own. Many runners carry a hydration belt with pockets for these items. Make sure you hydrate often. Many underestimate the impact the heat and humidity will have on their bodies even on a relatively cool day. It’s not uncommon to start the day in the 40s or 50s and end marathon in the 80s. Please read pages the Event Guide for more information on how to hydrate properly and other medical considerations. There will be one water stops along the 5k course and two water stops along the 10k course. Plenty of water out there and you won’t need to fuel for the 5k. You probably won’t need more than one gel (if that) for the 10k. Personally, these races are over so quickly we never bother to carry anything for these two events. Nine beverage stations will be set up along the course, offering water and POWERADE®. Stops are placed approximately every 1.5 miles along the course, and both water and POWERADE® will be available at all nine stops. There will be one food stop with Sport Beans® Energizing Jelly Beans® available at Mile 8.3. A total of 19 water and POWERADE® stops will be located along the course. All stops offer water and POWERADE®. There will be five food stops located along the course. Chiquita bananas will be available at Mile 112.1 and Mile 18.3. Sport Beans® Energizing Jelly Beans® will be distributed at Mile 15.9 and Mile 20.1. Sponges will be provided at Mile 17.9, and candy will be available at Mile 23.2. All runners must be able to maintain a 16-minute per mile pace throughout the race (except for the 5k which is not timed). Anyone who is not able to maintain a 16-minute per mile pace may be picked up and transported back to the Epcot finish area. This is known as the “sweep bus.” You may be picked up at any point along the course. Unfortunately, runners do in fact get swept. If this happens to you, be proud that you started the race. You had the courage to try and you started, which is more than most people will ever be able to say. We suggest you aim for at least a 15-minute per mile pace. Even if you are a much faster runner, be aware that there are many things that may slow you down. Bathroom stops along the course often have 5-10 minute waits. If you stop to take a picture with the characters that will slow you down as well. We’ve seen lines as long as 30040 minutes for popular characters along the course. I’ve heard that many people like to take a picture with every character. If you do this, you must be aware of how long those picture stops are taking you. You don’t want to get swept because you took so many pictures! There is nothing more exciting than finishing your race! When you enter the finish chute be sure to smile and celebrate your awesome finish. Characters may be there to high five you on your way in! The cheers from the crowd and the announcer will bring you in. Olympian Jeff Galloway advises against a sprint finish. 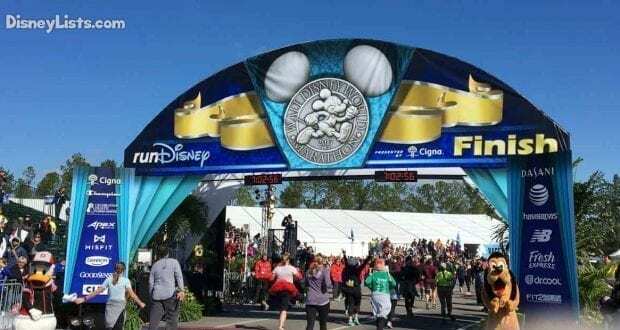 “Sprinting when tired is a major cause of injury and is likely to leave you sore and “wobbly” during your trip through the parks.” You will receive your medal as you exit the finisher shoot. You will also be directed to water and PowerAde. For the Half and Full marathon, you’ll be given a box with some snacks in it. A medical tent is also there if you need medical attention, including ice. All Dopey and Goofy challenge runners need to check in to their respective tents on Sunday to receive their medals. These are located after the finish line. Make sure you check in BEFORE leaving the finish area. Runners will not be allowed to re-enter the finish area once they leave it. You need to check in to verify that you have completed each leg of the respective challenge. On Sunday, once race officials have verified you have completed the necessary races you will receive your Goofy and/or Dopey medals. Congratulations! You did it! 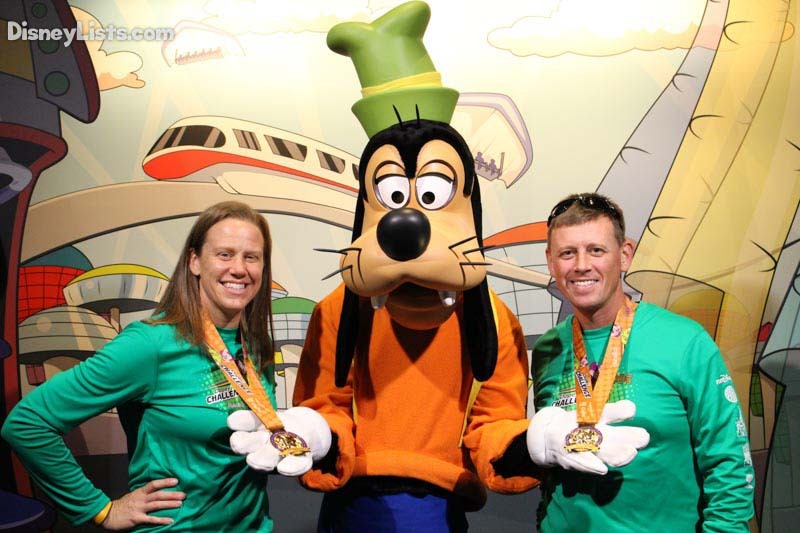 When enjoying Disney World after your race be sure to walk around wearing your medal(s). You’ll see a lot of people doing it, so join in and be proud of your accomplishment. You’ll even see people wearing them in the days following Marathon Weekend. Cast members and guests will love to give their congratulations. One tradition we have enjoyed is getting our picture taken with characters with our medals. The characters are great and always give us a thumbs up for our accomplishments. Disney magic once again makes the entire race experience wonderful! To get an even better understanding of Marathon Weekend races read up on our past race reviews by clicking on the links below.